If you have not already done so, please download, complete and return the above form available here. This form needs to be completed and retuned to Little Doves either before or on the day your child does their ‘build up’ session. Essex County Council requires the pre-school to have proof of the date of birth of your child in order to receive the Free Entitlement funding. Therefore, please bring in your child’s birth certificate so that their date of birth can be verified. Your child cannot be left at the pre-school unless all the forms have been completed and returned and you have brought in your child's birth certificate to be verified. All children will be allocated a staff member who will become their “key person”. This allows the member of staff to build up a special relationship with your child to give a sense of belonging and security. Your key person can then plan for the individual needs of your child. All staff observe, photograph, assess, make notes and comments on all the children but it is the key person’s responsibility to collate this information. Your child will be given a ‘Contact Book’ for extra communication and news which will travel between the pre-school and home. If your child attends another pre-school, please inform your key person. Each child is different in the way they settle and separate from you as they start pre-school. We are flexible and will accommodate the needs of your child during this process. Building firm relationships with parents/carers are important to us and therefore parents/carers will receive feedback on their child’s progress through regular visits as well as being encouraged to speak to staff. The key person and parents/carers working together on their child’s records of achievement is one way of celebrating together the child’s needs for well-being and continuing learning through play. We encourage “Parents as Partners”. As well as your child’s key person, the manager or one of the members of staff are available at the beginning and the end of every session should you have any concerns that you wish to discuss. If your child is staying for lunch club you will be required to provide a packed lunch and a drink with a freezer pack (please no food containing nuts and cut grapes into slices). When your child is ill/unable to attend the pre-school. Please telephone the pre-school as soon as possible if your child is unwell. Please check Our Illness Policy available here for when it is safe for your child to return to Little Doves, especially after sickness or diarrhoea (48 hours). If you have a holiday planned or are away for any reason and your child will not be attending the pre-school, please let us know as the number of children present on a particular day can affect our planning. Where possible, we do strongly recommend that your child attends the pre-school regularly as this helps them settle in quickly and get the most out of their pre-school education. Full fees are charged until the start of the term after your child reaches their third birthday. The current fees are £6.00 per hour and lunch club is £3.00 per day. For non-funded children, there is a non-returnable registration fee of £30 (£25 for siblings). There is no registration fee for funded children. Invoices are given out near the beginning of each half term. Payment can be made daily, weekly or half termly. We accept cash, cheque, internet banking payment and childcare vouchers. Essex County Council funds children the term after they reach their 3rd birthday (January, April or September). From this term children qualify for funding for up to 15 hours per week. If you are eligible for Extended Free Early Education Entitlement (30 hour) then you can claim up to 20 funded hours per week. Please send your child in appropriate clothes: water/sand/paint can easily spoil best clothes. Plimsolls (clearly named) are best for indoor play. Outdoor shoes and coats can be left on the clothes racks provided. Wellies for bad weather and sunhats for hot days too please. Please put your child’s name on everything possible. Little Doves Christian Pre-School T-Shirts, Polo t-shirts and Sweatshirts are now available to order. Please see Pam for more details. Please ensure that any jewellery worn by your child poses no danger; particularly earrings which may get pulled, bracelets which can get caught when climbing or necklaces that may pose a risk of strangulation. Please sign your child in and out of Little Doves every session, stating the time. This is an OFSTED safety requirement. If someone different is picking up, please fill in a white permission slip on the day. If this is a regular arrangement, please fill in a pink slip. If there is an emergency and you need to inform us over the telephone that someone else is picking up your child, you will need to give the pre-school and the person collecting, a password. Your child is your responsibility until they have entered the pre-school room and you have signed them in. The door will be locked again after about 15 minutes or when the staff are no longer at the door. Please ring the Little Doves bell after that time. Little Doves provides a healthy snack bar during the morning and all the children are encouraged to participate. We ask for a voluntary contribution of £1 per day to help cover the costs of the food and this is added to your half termly invoice. The healthy snack is optional, parents/carers are welcome to provide their own healthy snack if they prefer. As a pack-away pre-school we need to set up the equipment/toys every morning before the children arrive. We have a parents/carers daily rota to help with this setting up each morning. This will involve you arriving 15 minutes before the pre-school opens to help get the toys and equipment out of the cupboards and arrange the room. We are also setting up a rota for parents/carers to help out one morning or afternoon a term with the outside play area activities. If you are able to help with either of these jobs, please see Pam so we can add your name to the rota. We really do need your help - there are lots and lots of jobs that need to be done! We also invite parents/carers to come into the pre-school and to help on an occassional basis, inviting them to share their skills with us, for example, cooking and gardening. Please let us know what skills you maybe able to offer. Please supply spare clothes or nappies as necessary. Please keep your key person updated on your child’s progress. If your child wants to bring in a toy to ‘show’ please check with the themes for the week ie colour, shapes, topic etc. You may bring in sweeties or cakes if you wish but please speak to a member of staff. Please keep the bringing in of other toys to a minimum, however comfort toys are allowed. We carry out a ‘2 Year Old Assessment & Progress Check’ for all 2 year olds. Please keep your child’s key person updated with your child’s allergies or medical requirements. In the foyer are “WOW” certificates. These are for you to tell us about the wonderful achievements your child has made, for example, they slept all night in their bed. Please fill them in and give them to a member of staff. Little Doves Christian Pre-school offers planning and assessments in line with the Governments “Early Years Foundation Stage” guidelines. We actively promote inclusion, equality of opportunity, the valuing of diversity and British values. If you would like to view your child’s folders at any time, please speak to your child’s key person to arrange a 10 minute appointment. We hold open afternoons in the spring term and these provide a more formal opportunity for you to meet your child’s key person to discuss progress and any concerns. Children have daily opportunities to access physical play and they have a large space in which to move around. The children are encouraged to play outside daily (weather permitting) with the specialised toys/equipment. 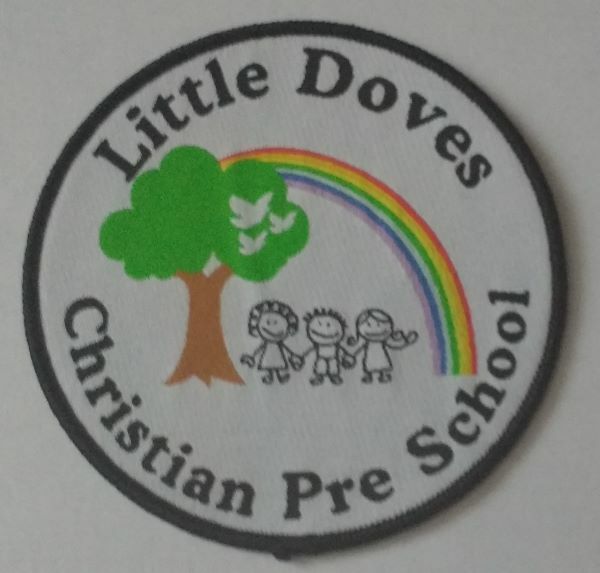 Little Doves Christian Pre-school regularly arranges for external educators, such as, a dancing teacher to provide physical activity sessions at a small additional cost to the parents/carers. PLEASE KEEP US INFORMED OF ANY CHANGES IN CIRCUMSTANCES ie EMERGENCY TELEPHONE NUMBERS / ALLERGIES etc.